Oh yes, it is disgusting. Saying that, he is probably still the best looking guy on the show. I really like GG as well. I liked how she said to Raquel, "are there unicorns in this fantasy world that you live in?" Sandoval and Ariana are completely horrible though. 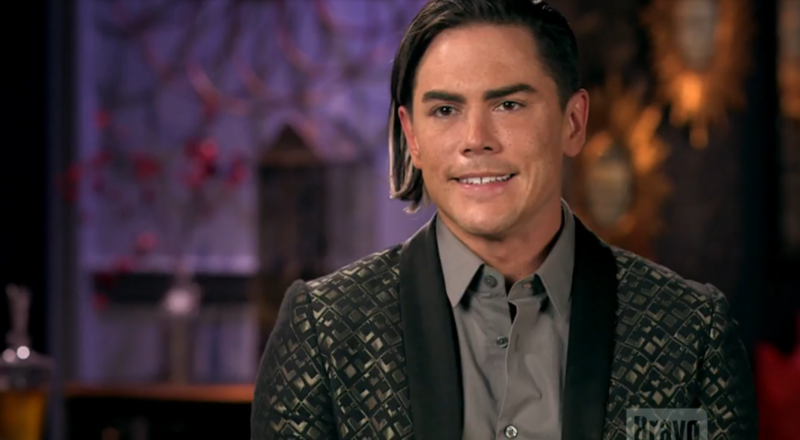 Pump Rules returning in December. * Trouble in paradise for Ariana and Tom. * Kristen throws a drink in Schwartz's face (I wonder what happened there). * Stassi still saying "It's my birthday!" and begging her ex-boyfriend not to break up with her. * Lala and Scheana arguing about Scheana's boyfriend? * Brittany and Jax having a few arguments as well. CORRECTION: it was James. Ha ha. How good does this look? I can't wait! What happened to her face? Also is she really only 29? And did she really have a relationship with that creepy guy with the fat face, Jax I think, ewwwwwww? So is anyone watching this season? Katie has been featured very little which is okay with me. I can’t believe Stassi is back in Lisa’s good graces, but I guess it is, after all tv. I never got the Jax and Brittany relationship, but it was piggish of him to cheat on her with a mutual friend. Although that is part of his m.o. silver lining: no gigantic Sheena wedding pictures this year. I agree. She’s aging quickly. Too much alcohol. I have been watching. I love this season so far but hardly anything new. Kristen still sticking her nose into other peoples business. Jax still cheating. Etc. What do you think @delcan ? My favourite line was by Schwartz to James: "You should be ashamed of yourself, #$%^&". Looks like James, Raquel and Billie may be season villains? - I really like Stassi's new boyfriend. - James is still very rude. I wonder what he said about Britney to make her cry. - Tom looking as good as ever. - Lala declaring that her friendship with James is non-existent at the moment. Probably for the best. - Kristen saying that she is a karma police and it is coming James' way. - Jax's engagement to Britney. Only episode one and Billy is already showing signs of entitlement as well. - James being a pos once again. - Idiot Raquel believes POS James. Lala was correct giving her a title. - Beau meets Lisa. Looks like Lisa approves. - I won't comment on Scheana's singing performance..
James' firing was perfectly orchestrated by Katie. Well done.